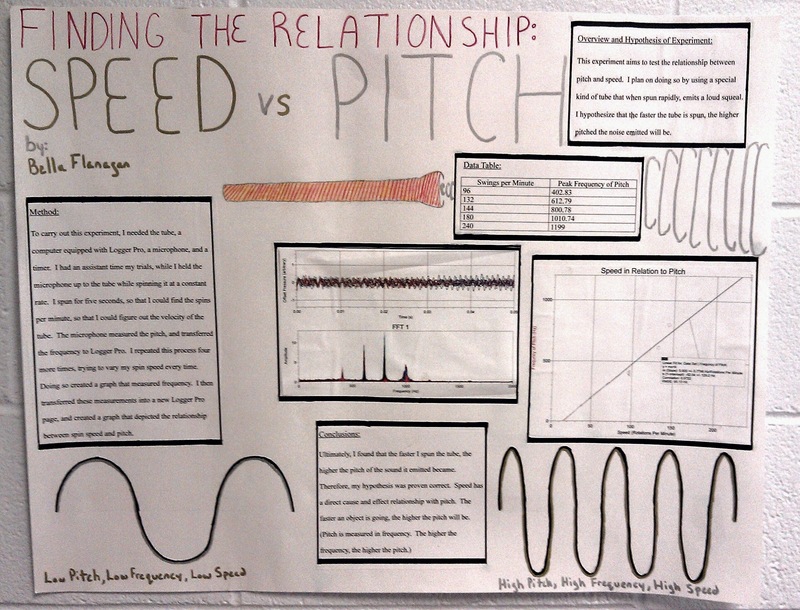 College-Prep Physics: A student project investigating the relationship between the rotational speed of a whirly tube and the pitch produced. The student used a Vernier microphone and Logger Pro to produce an FFT graph which indicated the pitch of the note produced. The student used the video camera on her iPhone to record the twirling so she could get an accurate number for the rotational speed in RPMs. 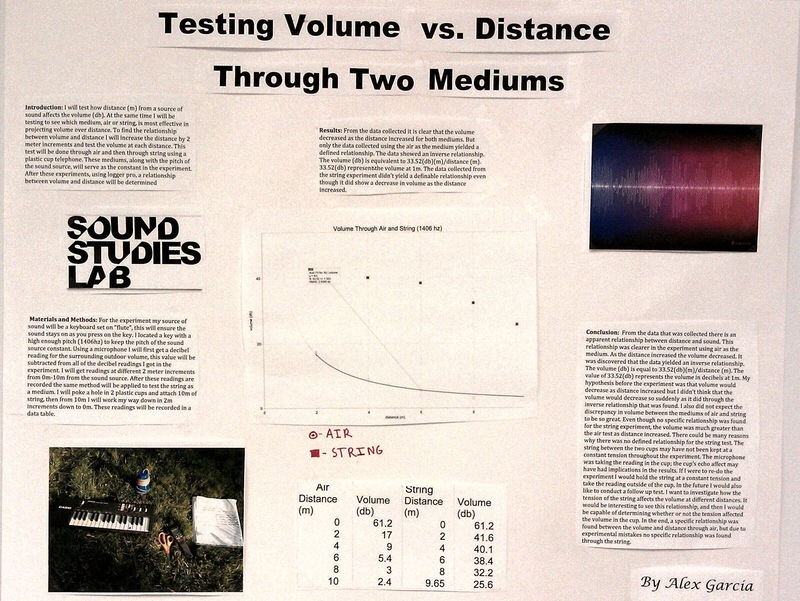 College-Prep Physics: A student project examining how volume varies with distance. 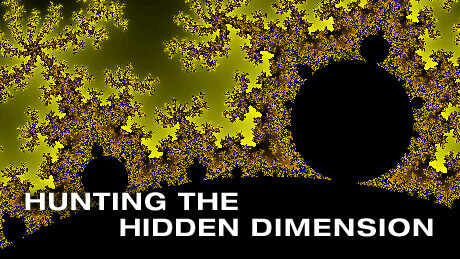 Is it inverse square like light and gravity? Is it different in different media? The student used a Casio keyboard to play a sustained note and used a Vernier sound meter to measure decibel levels at various distances. 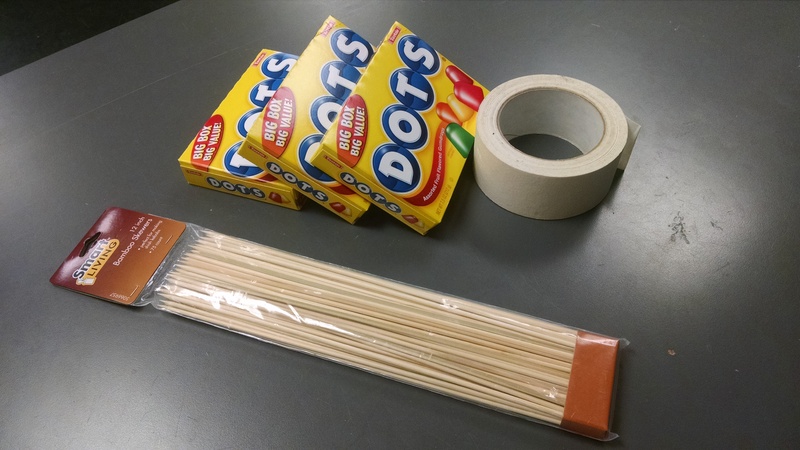 To test a different medium, the student used to cups connected by string, and used various length of string between the cups. The sound using the cups and string was always louder than in air at the same distance, but it didn’t drop off in the same way as in air. We wonder whether the tension in the string might have something to do with it. Our reasoning being, if the string is more taught, the sound travels faster through the string and reaches the end with less decrease in amplitude, and therefore would sound louder. It is likely that the tension in string wasn’t held constant for different length string. AP Physics C: We finished reading Arcadia and began exploring the (sometimes chaotic, sometimes predictable) behavior of a simple logistic equation for modeling animal populations. The handout is here: Valentine’s Grouse: An Exploration of Chaos in Populations. And you can explore it yourself using my version of the population program in GlowScript. 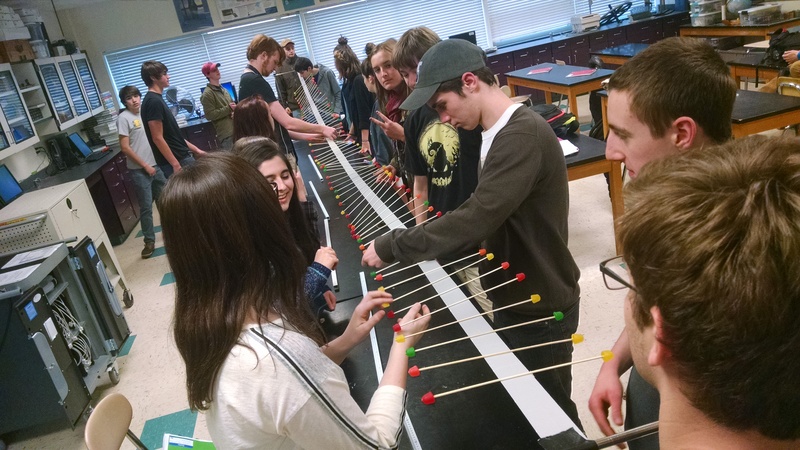 College-Prep Physics: Wrapped up the wave/buggy lab from yesterday. We determined the model for our data to be wavelength = speed / frequency. Conceptual Physics: Students finished building/testing their bike circuits and began drawing and annotating their final circuit diagrams. Conceptual Physics: Students finished building and testing their modified bike light circuits and began making their final annotated circuit diagrams. AP Physics C: All but one student was taking the AP Macroeconomics exam today. We’ll finish reading Arcadia tomorrow.